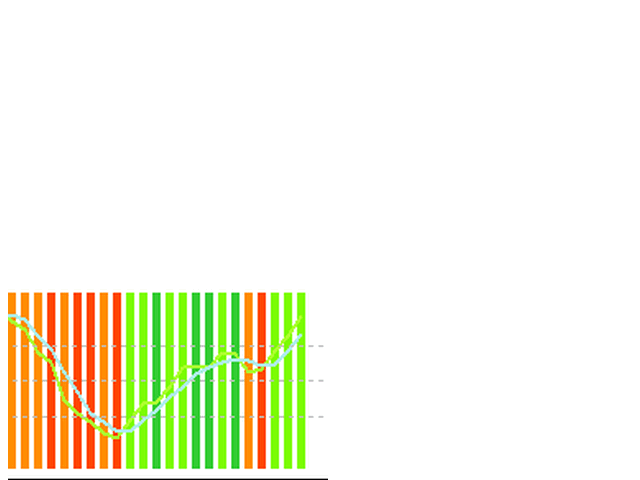 The new FTrend trend indicator, based on the common Stochastic indicator, which shows both the trend as colored histograms at the bottom of the chart and the strength of the trend. The indicator also displays the trend direction on different timeframes, which allows to receive a precise entry signal by analyzing the values of the price movement direction on different timeframes. When the terminal interface language is changed, the FTrend indicator displays the data on the trends of the other timeframes in the data window in English and Russian. Strong Up means that the current timeframe is developing a strong uptrend, as indicated by the Stochastic line. Weak Up means that the upward movement calms down, and it is time to think about closing the Buy positions. Strong Down means that the current timeframe is developing a strong downtrend, as indicated by the Stochastic line. Weak Down means that the downward movement calms down, and it is time to think about closing the Sell positions. The Stochastic lines allow to see the overbought and oversold levels, where the trend is likely to change. Trading plan for buying: when the values of the trends on D1, H1, M15 - Strong Up, look for a buy entry. Trading plan for selling: when the values of the trends on D1, H1, M15 - Strong Down, look for a sell entry. Once the Weak Up and Weak Down signals appear, it is time to think about exiting the open positions. StK - Period of the K line of the Stochastic indicator. StD - Period of the D line of the Stochastic indicator. StS - Slowing of the Stochastic indicator. Wind - Trend display window, 0 - main chart window, 1 - indicator window. SUP - Text and arrow color of Strong Up. WUP - Text and arrow color of Weak Up. SDN - Text and arrow color of Strong Down. 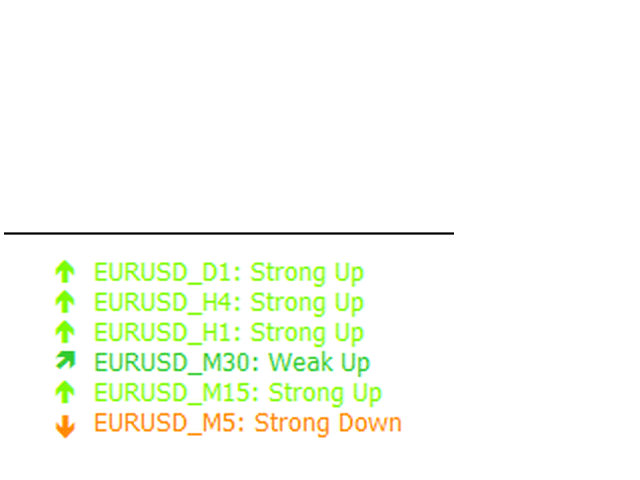 WDN - Text and arrow color of Weak Down. 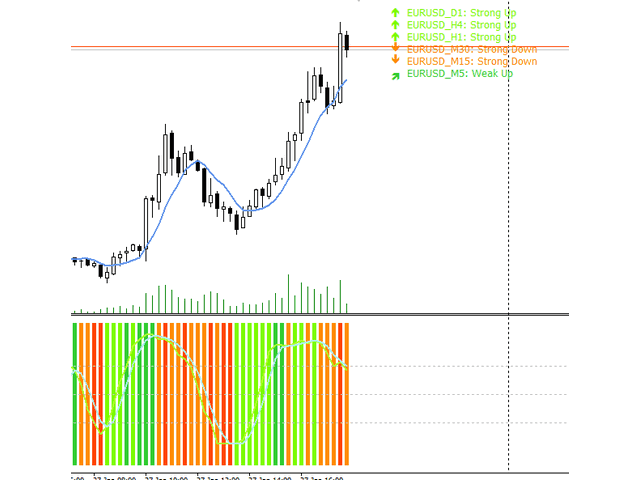 This indicator is best used on M15, while monitoring the values of H1 and D1 along with other indicators that support entry signals. For example, FTrend shows an upward reversal of the Stochastic from the oversold area on М15. The values of Н1 and D1 are Strong Up. The price crossed the SMA7 upwards. Open a Buy position. The FTRend indicator shows Weak Up on Н1 and the price approaches the SMA7 - close the Buy position. For example, FTrend shows a downward reversal of the Stochastic from the overbought area on М15. The values of Н1 and D1 are Strong Down. The price crossed the SMA7 downwards. Open a Sell position. 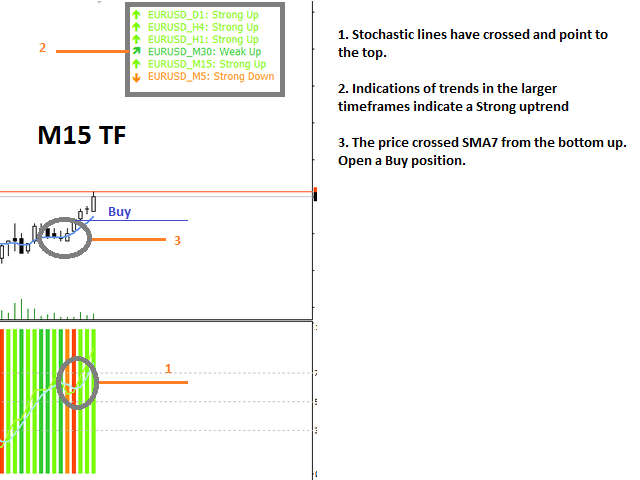 The FTRend indicator shows Weak Down on Н1 and the price approaches the SMA7 - close the Sell position. The new version includes two lines of the Stochastic indicator from a higher timeframe. The timeframe is specified in the TfSst variable of the settings interface, the default value is PERIOD_H1. In addition to the indication of the trends of all timeframes, also added the digital values of the Stochastic indicator on the displayed chart.